Last week I visited New York City for the first time and I completely fell in love with the city. Unsurprisingly I spent my time visiting some of the popular tourist destinations - Central Park, Rockefeller, World Trade Centre etc - but I also managed to fit in a few stationery stores and pick up some lovely new tools. I had prepared a list of stores I wanted to visit, however despite my intentions I only managed to fit in two stores during my short visit. Kinokunyia is first and foremost a Japanese bookstore, but on the lower level there is a small-ish stationery department. 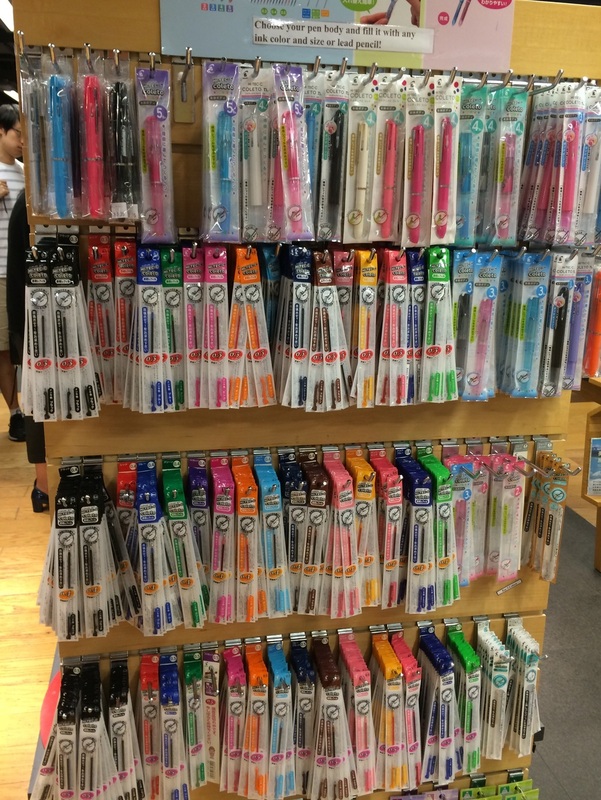 There is a fantastic pen and pencil section filled to the brim with gel pens and pencils. I spent quite some time looking at all the different brands that they had on offer and appreciating the vast colour selection on the gel pens. I haven't been in a physical store like it before so this was a bit of a treat. They also had an interesting mechanical and woodcase pencil section including some branded pencils I had not seen before. But I will save these details for another post. My favourite display area in Kinokunyia was the Pilot Coleto end of aisle display - shown here on the right. This was filled with all the Coleto refill colours in all available sizes - 0.25, 0.4 and 0.5mm. The different barrel options were displayed ranging from the entry level plastic Coletos to the higher quality aluminium designs and each with different number of refill slots. Gel pen customisation at it's extreme. Alongside the pens and pencils on show there was a wall of paper showcasing different Japanese notebooks, writing and letter paper. Mirdori Travelers Notebooks also were featured, cased in their own display cabinet under lock and key. I really enjoyed Kinokunyia and could have spent a lot more on a lot of the products they had on offer. My husband spotted the tell-tale pencil logo as we were seeking out CW Pencils. A great sign! I had to take the time to visit CW Pencils. I listen to the Erasable podcast where CW Pencils is mentioned regularly and Caroline Weaver has featured as a guest so I was well aware of CW Pencils and what they have to offer. I have never bought anything online from CW Pencils, but I felt a visit to the physical brick and mortar store was essential. The store is much smaller than I expected, but then again pencils are small. The layout and display of the pencils are fantastic. You get a clear view of everything on offer. 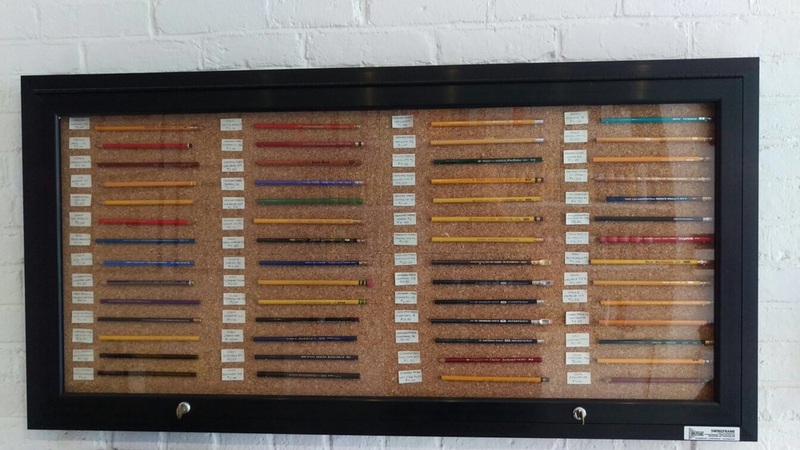 I really liked the cork board display with prized pencils under lock and key. I may add a smaller scale version of this into my office at home. My favourite section within the shop was the testing table. It has draws filled with different types of pencils by all the different brands on offer, where you get to try before you buy. I personally found this very useful and it definitely helped me to make a few decisions. I wish I was able to fit a few more stores in during my visit. I saw the Fountain Pen Hospital from a taxi on our final evening, but I didn't have time to visit. If I get a chance to visit New York City again I will make sure that I find more time to fit in more of the stores in the big apple. For a run down of some of the best stores in Manhattan I found The Gentleman Stationers post very helpful.